Aireloom and Kluft mattresses are made by E.S.Kluft & Company and sold at upscale retailers across the country. If you’re looking for a luxury mattress, chances are you’ve heard of these brands. In this guide, we’ll be discussing both of these brands, what makes them different from each other, what materials go into making their beds, and lastly, Aireloom and Kluft mattress reviews to help you decide if a Kluft or Aireloom mattress should be your next bed. Both Aireloom and Kluft beds are made with high-quality foam, latex, coil systems, and other natural materials. Not only do these beds use quality materials, but they’re also handmade, which might explain why these beds don’t come cheap, with mattresses ranging in price from $2,000 to $30,000. All of their mattresses are handmade in the US, specifically in Pennsylvania and California. One of Aireloom’s main selling points is it’s California Design. Meaning, they design their mattresses outer layer to be reminiscent of California beaches. Aireloom carries six mattress collections. Each collection contains two or three different mattresses. The Aireloom mattress collections are Karpen Luxury, Karpen Sidestitch, Aireloom Latex, Preferred, Aspire Hybrid, and Aireloom Pillow. Kluft carries four mattresses in total. The four mattresses are called: Beyond Luxury, Kluft Signature, Royal Sovereign, and RS Latex. Though the same company makes each of these brands, each brand has its own claim to fame. Kluft mattresses are designed to be luxury and are marketed as so. On the other hand, Aireloom mattresses are designed to provide a specific type of feel for the sleeper. The patented “Aireloom Lift” feature included in Aireloom beds increases areas of low pressure within the bed to make the sleeper feel as if their mattress is cradling them. Your unique mattress preferences will help you determine whether you should be buying an Aireloom or Kluft mattress. If you’re looking for a luxury bed made from high-quality materials, Kluft is for you. If you prefer a softer, cradling feel from your bed and are looking for a mattress that’ll provide just that, an Aireloom bed is more fitting for you. For the sake of organization, we’ll be breaking this guide down by collection, discussing the mattresses in each collection and the materials used in each bed. As we mentioned earlier, the most significant feature of the Aireloom mattresses is their propriety Aireloom Lift™. The Aireloom Lift™ is a hollow chamber in the bed between the coils and comfort layers above. When you lay on the bed and sink into the plush material making up the top layers of this bed, this chamber adapts to your body to provide exceptional pressure relief for your entire body. By including this unique feature in their mattresses, they’re increasing the bed’s pressure point relieving abilities, while at the same time they’re making the bed more breathable. The hollow chamber allows for air to flow smoothly out of the mattress, which should reduce the chance of hot air being trapped in the bedding. Aireloom mattresses are found at retailers all over the world. To find the closest retailer to your location, visit their website and use the “Find a Retailer Near You” tool. Now, we’ll discuss the collections and break down the mattresses in each. The Karpen Luxury collection has two mattresses— the Luxetop™ design and the Original Streamline™ design. Beds with the Luxetop™ design have a pillow top, while mattresses with the Original Streamline™ design do not have a pillow top. The Luxetop™ mattresses come in three different firmnesses, Plush, Firm, and Luxury Firm. The Original Streamline™ mattresses only come in Firm and Luxury Firm. Traditionally, back and stomach sleepers do well on firmer beds because they have the support to promote your spine’s natural alignment and prevent you from sinking uncomfortably into the bed. Softer mattresses are typically better for side sleepers because they allow the hips and shoulders to sink into the mattress enough to relieve pressure points. If a side sleeper sleeps on a firm bed, it could create pressure points in those areas because they’re pressed against the mattress. On the other hand, if a stomach sleeper sleeps on a mattress that’s too soft, it can cause their torso to sink in too far, creating an unnatural curve in the spine. Over time, this can lead to discomfort and even spinal issues. Considering those points, the Luxetop™ mattress can be a fit for most any type of sleeper, back stomach, or side; while the Original Streamline™ mattress is better suited for back or stomach sleepers. The price of these mattresses will vary from retailer to retailer and usually aren’t listed on the different retailers’ websites. To make sure these beds fit within your budget before you drive to a store to test them out, request more information from these retailers to get transparent pricing. We noted before both Kluft and Aireloom mattresses are handmade. Because they’re handmade, they do not disclose the design of these layers or discuss the functions of the different materials used in the bed— doing so could compromise proprietary company information. They do, however, disclose the materials they use in each layer. The Karpen Sidestitch collection includes the Karpen Sidestitch Super Featherbed and the Karpen Sidestitch Rip Van Winkle. If you’re unfamiliar with a featherbed, it’s traditionally made from feathers, down, or a combination of both materials. Featherbeds were popular in the 14th century but are commonly found nowadays in a topper form to add to your bed. They are known for having a softer feel and, considering they use feathers and down, can sleep hot. If you’re prone to sleeping hot, or you live in a warmer environment, a featherbed of featherbed topper may cause you to overheat at night while you sleep. If you have no concerns regarding heat, a featherbed is a luxurious bedding option that should feel super plush and soft to the sleeper above. The Karpen Sidestitch Rip Van Winkle is available in Luxury Firm, Medium Firm, and Extra Firm. If you value comfort from your bed and are looking for a softer mattress, the Super Featherbed is probably a good fit for you. If you’re a back or stomach sleeper, you’ll probably fair better on one of the Rip Van Winkle mattresses. The Karpen Sidestitch collection was recently modified, making the design of the bed adjustable base friendly. The side stitches in the mattress provide extra durability for the bed, which should ensure it’ll last for years to come. If you value durability and meticulous design, the mattresses in the Karpen Sidestitch could be right for you. The Aireloom Latex collection has two mattresses— the Aireloom Latex Luxetop™ design and the Aireloom Latex Streamline™ design. Sound familiar? That’s because the beds in the Karpen Collection have very similar names. Remember, the main difference between the two models is that the Luxetop™ mattress contains a pillow top, while the Streamline™ design does not. If you prefer your bed to feel soft to the touch, you’d probably prefer a pillowtop bed. If you prefer a more “on the bed” feel from your mattress in regards to firmness, you’d probably be better off with a Streamline™ mattress. 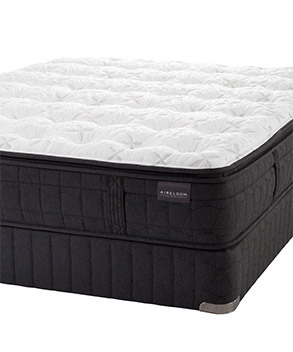 The Aireloom Latex Luxetop™ mattress is available as Ultra Plush with a latex core, perfect for those who love a softer bed. The Streamline™ mattresses are available in Plush with a latex core, Plush, Firm, and Luxury Firm. The Aireloom Preferred collection contains three mattresses: Preferred Luxetop™, Preferred Streamline™, and the Preferred Channel Streamline™. In 2017, Aireloom redesigned it’s Preferred collection to have a more sophisticated look, and now one of the most noticeable and distinguishable features of these mattresses are their plaid borders. 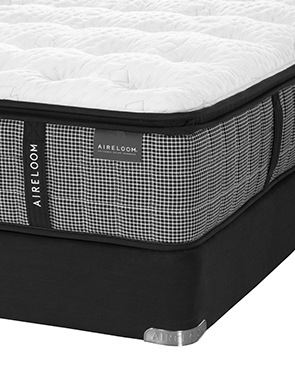 In addition to their new and improved exterior, Aireloom advertises these mattresses as having a soft to the touch feel, due to the use of Tencel® fabric in the cover. The Preferred Luxetop™ is available as Luxetop™ M1 Micro Coils Firm, Luxetop™ M1 Micro Coils Plush, and Luxetop™ M2 Micro Coils Plush. The Preferred Streamline™ is available as Plush, Luxury Firm, and Extra Firm. The Preferred Channel Streamline™ is available as Plush and Firm. 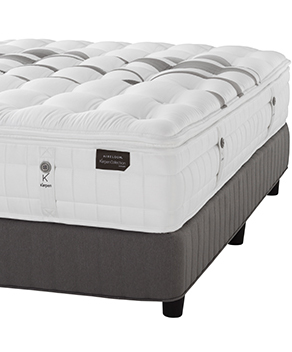 The Aspire collection contains two hybrid beds called the Aspire Hybrid Coil Support and Aspire Hybrid HD Foam Support. Though all of their mattresses are technically hybrids, because they use a combination of materials, their hybrid beds are designed to offer an even mix of comfort and support. Hybrid mattresses are already pretty breathable and have minimal concerns of sleeping hot, but Aireloom went the extra mile adding cooling technologies into this bed. If you tend to wake up hot in the night, an Aspire Hybrid may be your solution. 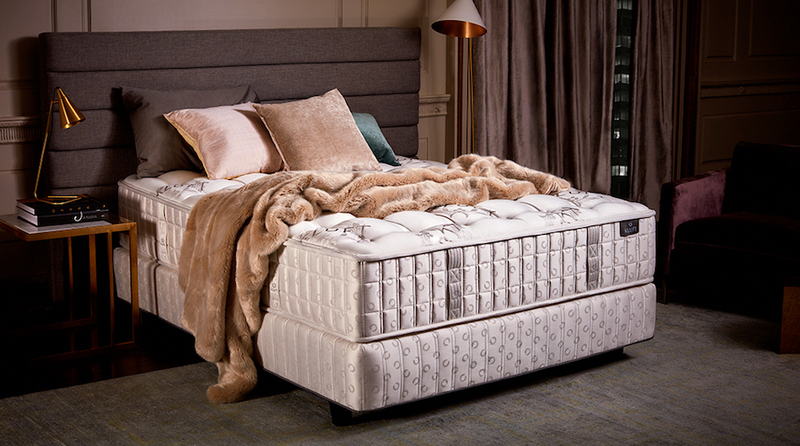 The Hybrid Coil Support mattress is available as plush or firm while the Hybrid HD Foam Support mattress is available as Plush, Luxury Firm, and Firm. 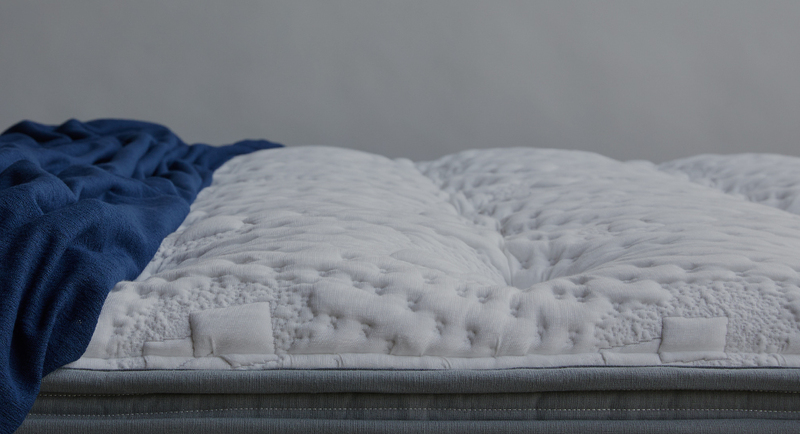 Now that we’ve covered each of the mattresses Aireloom sells and the materials they use to make their luxurious beds, it’s time to talk about the long-term warranty coverage. Depending on the model you buy, your warranty could be for 10, 20, or 25 years. The warranty covers any defects in the workmanship of the mattress and any sags or indentations that are a minimum of an inch and a half deep into the bed. It’s important to note the warranty probably will vary from retailer to retailer, so it’s important to ask how long the warranty is for and what the warranty covers explicitly before you buy. Additionally, be sure to research the retailer itself. When reading reviews, for Aireloom mattresses, we found a lot of negative reviews about them not upholding their warranty agreement. A warranty is no good if a company, or retailer, does not withhold their end of the bargain. If a company or retailer is constantly finding loopholes out of fulfilling their side of the warranty agreement, it’s probably best to buy from another retailer. When Aireloom first hit the market in the 40s, they were thought of as the most luxurious mattresses. They could be found in the homes of Hollywood’s elite and even Ronald Reagan was a fan, swapping every White House mattress with an Aireloom bed. In more recent years, it seems customers are not as happy with their Aireloom beds as they used to be. When researching these beds and reading customer reviews we noticed one glaring trend, premature deterioration and sagging. Most reviews mention owning the bed for only a few years and experiencing aches, pains, indentations, and body impressions. With the hefty price tag these mattresses come with, it’s crucial they are built so you get your money’s worth. In our opinion, there are better mattresses out there to buy for a much cheaper price tag. However, if you’re set on buying a luxury mattress, Aireloom is worth researching and considering. Before you buy, read customer reviews about the specific mattress you’re looking at as well as reviews about the retailer itself. Additionally, be sure to ask the retailer questions about the warranty and if they offer a sleep trial. A sleep trial is an in-home test drive, essentially. After you buy your mattress, some retailers will give you a certain amount of nights to try it in your home and decide if it’s the best bed for your own sleep needs. If you choose within the trial period you’re not happy with your purchase, you have the option to return (or exchange, depending on the retailer). If the retailer you’re buying from offers sleep trials, that’s a great way to test the mattress and get a more genuine feel for it. If they don’t, look around for other retailers who do offer sleep trials, and see if they carry the mattress you want to buy. 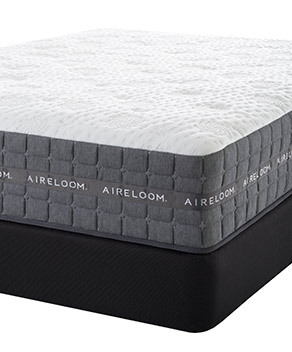 All in all, an Aireloom mattress could be a good investment in your night’s sleep. Just be sure to research the bed and who you’re buying from before you make a purchase. The most significant selling point of the Kluft mattresses is that they’re a “luxury” bed. E.S. Kluft & Company go out of their way to integrate state-of-the-art materials into these mattresses. 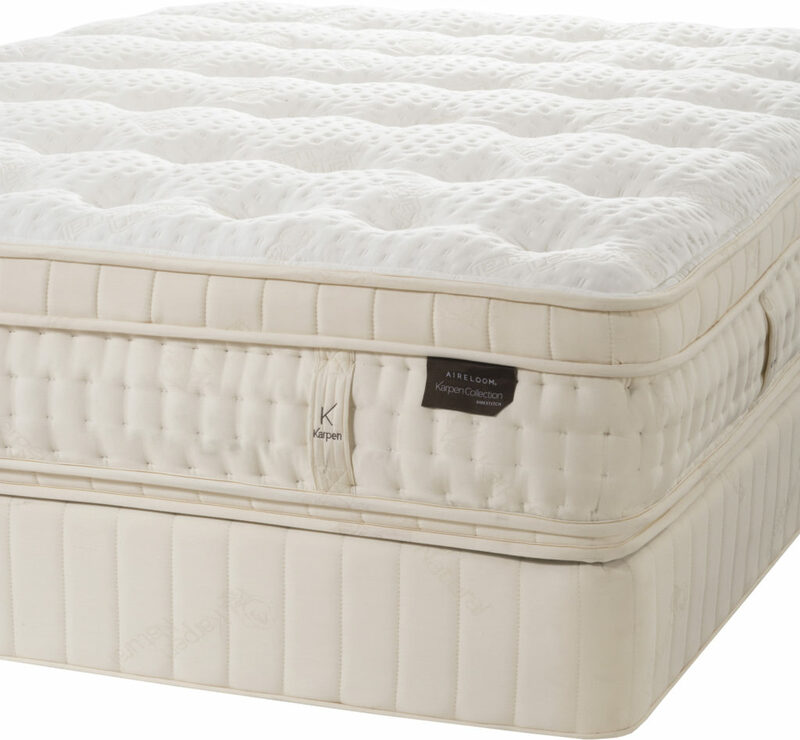 To refresh, Kluft carries four different mattresses: Beyond Luxury, Kluft Signature, Royal Sovereign, and RS Latex. These mattresses can also be found worldwide at various luxury retailers. In the table below, we’ll be breaking the materials in each of these mattresses to help you choose which one interests you most. Beyond Luxury, Kluft Signature, and Royal Sovereign mattresses are all innerspring beds and offer a bouncier feel. Because they use coil systems in their mattresses, their beds are not superb at isolating motion. If you tend to toss and turn at night, or you share the bed with a restless partner, an innerspring bed is probably not the best choice as any movement will be transferred from sleeper to sleeper. Their RS Latex mattress is the only one without a coil system and is a true latex mattress. Latex beds are known to prevent and reduce pressure points, aches, and pains. The support a latex mattress provides should also promote your spine’s natural alignment. If you’re somebody who commonly experiences joint and muscle pain or pressure points, a latex mattress may be a good solution. Additionally, latex mattresses isolate motion pretty well, meaning they’re a great choice for somebody who shares the bed with a partner who tosses and turns at night. From our research, we found the retailers who carry Kluft mattresses typically carry most standard sizes, and the starting price for most of these mattresses is around $2,500 to $3,000. These mattresses come in a variety of firmnesses, but the availability of these different firmnesses will depend on the retailer. Before you drive store to store, call and ask the retailer if they have the specific model you’re looking to try. The warranty your new Kluft mattress will come with varies from retailer to retailer, some retailers may offer multiple warranty policies and give you an option to choose which one you prefer. Their warranty covers a visible sag or indentation in the mattress’ surface. For the latex mattresses, the indentation in the surface must be at least ¾”. In all of their other beds, the indentation must be at least an inch and a half. If your mattress is deemed defective, E.S. Kluft & Company will either repair or replace it entirely. In the event of a repair, you would be responsible for shipping the mattress back to them and covering any transportation costs. It’s important to note, E.S. Kluft & Company reserves the right to refuse to repair your mattress is your original mattress is deemed unsanitary by them. To make sure your warranty isn’t voided, and for obvious sanitary reasons, use a waterproof mattress cover with your bed. Before you buy your mattress, be sure to ask the retailer about specific warranty information. Also, remember to ask if they offer a sleep trial. If they do, it’s a convenient and risk-free way to try your new bed at home while deciding whether or not it’s the best mattress for you. When searching online for customer reviews of Kluft mattresses, it was mostly unsuccessful. We found Kluft has about a 75% owner satisfaction rating. Most of the positive reviews of Kluft mattresses mentioned the superb support they offer, with customers stating they’re now waking up without aches and pains. Just like Aireloom, there was one consistent trend amongst the negative reviews regarding the durability of the mattress. Many 1-star reviews mention they’ve had their mattress for only a few years and they’re already noticing it lacks in support or is starting to show signs of sagging. In most positive reviews, customers directly stated they had only had the bed for a week or a few months. Whereas most of the negative reviews came from customers who have had their bed longer. Have You Found Your New Bed? If you’re in the market for a luxurious mattress, Aireloom and Kluft are two great brands to research and consider. Because these beds come with a hefty price tag, we recommend asking many questions regarding the durability of the bed and the warranty specifications before you buy. Investing in your night’s sleep by buying the best mattress for yourself is an excellent way to ensure you’ll get restful sleep most nights; but if your investment doesn’t end up paying off in the long run, it could lead to a lot of money wasted.